22Bet is one of the most popular online sports betting operators in Nigeria. Those that will choose to register with 22Bet using a 22Bet promo code can expect a generous 100% bonus that will match their first deposit up to N50,000. However, you may also use a 22Bet promo code to unlock several more promos, such as the casino offer that rewards players with up to N130,000 and 22Bet Points. What can I get with the 22Bet promo code? The following table highlights the main bonuses you can claim with a 22Bet promo code. Do ensure you come back to it regularly for the updated details, as more 22Bet promo code offers become available over time. Click on the button you will find right below this list. You will be redirected to the official 22Bet website. Click on the green “Registration” tab to open the sign-up form. Complete the form with your email, full name, and password. Alternatively, you could sign-up using a social network account. Hit “Register” to confirm your registration. Select the welcome bonus you wish to receive (sportsbook or casino offer). Now that you have created your account, you can go on and make a qualifying deposit to obtain the bonus you have chosen to chase right after funding your account. The bonus is available to new Nigerian players only that are over 18 years old. 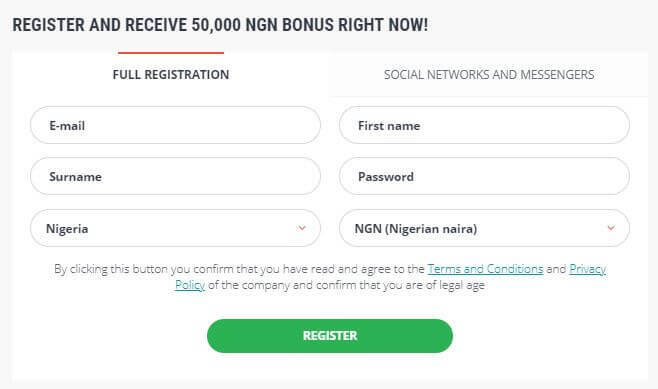 The maximum bonus amount you can receive is N50,000. Wagering requirements apply (5x the bonus sum) so that you can withdraw your winnings. To qualify for the bonus, you need your bet to have, at least, three selections, each of odds, at least, 1.40. If you do not use the bonus within the first 7 days after you have received it, it becomes void. If you are not much of a 22Bet sports betting fan and prefer the casino, the bookmaker has a nice welcome bonus for you, which is described below, followed by a second 22Bet promotion that will make your Fridays way more fun and interesting! To go after this welcome offer and load your account with up to N130,000 and receive 22 Bet Points, you need to make a deposit of, at least, N100. And, don’t forget to register with the 22Bet promo code the same way you would do if you wanted to claim the sportsbook promo. Note that terms and conditions apply. For example, before you can withdraw your bonus-related earnings, you must wager the bonus amount 50 times. Also, there are some 22Bet games restrictions so make sure you read the details of the bonus before claiming it. The Friday Reload is a bonus offered to all 22Bet players. This means that there is no geographical restrictions (i.e., have to live in Nigeria) to obtain it. What this promo gives you is a 40% deposit bonus for your Friday endeavours (T&Cs apply). The minimum deposit you can make to qualify is one euro or dollar. Wagering requirements also apply but are far from strict (3x the bonus amount), which makes it easily obtainable. The bookmaker offers a wide range of sports (more than 30), with the primary focus being on football. There, soccer enthusiasts will find everything over 1,000 events from the English Premier League, UEFA Champions League, and Bundesliga to La Liga, Copa Del Rey, Serie A, Ligue 1, and Campeonato Baiano, to name a few. Of course, the NPFL is also well-represented with tens of games available almost at any given time. Those not very fond of football will also access a plethora of markets and leagues related to other sports, such as ice hockey, basketball, and tennis. Plus, you can bet on Special bets, Politics, and Entertainment. As for the odds provided, these are definitely on par with the market average while there are markets where the offered odds are none the least satisfying (3% for 3-way football markets). So, it is a mix of feelings here. Where the operator somewhat compensates for those low odds is with the betting types available that include Handicaps, as well as corners, scorers, halves, and more. In-play live betting is provided in high-quality at 22Bet, enabling players to bet on a sporting event as it unfolds. Among the most popular sports on which punters can bet live are football, basketball, and tennis, where there is more abundance of events than with other sports, with nearly 100 in-play markets. The handy graphics, available statistics, and more than decent betting margins make live betting exciting indeed. Unfortunately, neither cash out nor live streaming are available, but there is a good chance they become part of 22Bet’s services and features in the near future. 22Bet hosts both a fully-functional, mobile-optimised mobile site and a dedicated mobile app for its Android and iOS users. In the first case, you simply use your mobile phone’s browser (or your tablet), type in “22Bet” to be taken to the 22Bet mobile version and easily access the site. If you scroll down the homepage of the mobile site, you will also find links to download the 22Bet app on your Android or iOS portable device. Note that if you are using a Safari browser, you may have issues with the download so choose either Google Chrome, Firefox or other options. Regardless of the method you use to take your 22Bet experience on the go, you will have everything well-organised in a single page in a straightforward and easy-to-navigate fashion. You can do everything, from signing up with a 22Bet promo code and claim the sportsbook and casino welcome bonuses to placing in-play and pre-match bets and playing casino games; all are under the same roof. Cryptocurrency (Bitcoin, Monero, Litecoin, Ethereum, and Dash). All deposits are processed immediately (except for cryptocurrencies that need a few minutes to show) and come with zero charges. As for withdrawals, the same payment options apply, more or less, but transactions may take up to 7 business days to clear, depending on the funding method you have used. Also, check out the minimum and maximum deposit and withdraw limits that apply per payment option so that you know what to do. To have a question answered or a problem addressed pronto, you can use the live chat function, whose availability is not clarified. Alternatively, you can email the operator and wait up to 24 hours (or more) for a reply or complete the online contact form and receive a response in the next 24 hours. Before you seek the assistance of a customer service agent, though, do check out the comprehensive FAQs section because chances are the answer to your question is there already. 22Bet is an operator that can attract the attention of Nigerian players with the fantastic welcome bonuses, the available promos for existing customers, the wide array of sports betting markets, leagues, and events and the excellent in-play service. The low wagering requirements for some promotions also excite. Where it slightly disappoints is with the odds margins that are quite low for some sports and the lack of cash out and live streaming functions. Nevertheless, the mobile experience is enhanced and provides the full spectrum of options players find at the desktop version while players also get to fund their account with cryptocurrencies, which is not available by many bookmakers out there. Before you hit the Contact Us button at the operator’s platforms, have a look at the following section that highlights the most asked questions 22Bet players make concerning the 22Bet promo code. Is there a 22Bet code currently available? Indeed. Check out the table at the beginning of this review for all available codes. Only people living in Nigeria, who are, at least, 18 years old. No, though this could change shortly. For now, you can use your mobile device and do everything you would do from a desktop, including signing-up and using the 22Bet promo code to claim the welcome bonuses. No, you may not use one bonus in conjunction with another offer. If you meet the qualifying criteria and have made a qualifying deposit, then you do need to get in touch with a customer support agent for guidance. Copyright © 2019 · www.promotion.com.ng · Write us · Gambling addiction is a real threat!